As I sat there listening to my dog gnaw on a stick, I found myself looking beyond the yard where my eyes landed on the railroad tracks. Tracks that have been there for nearly 150 years. Tracks that were the focal point of commerce for quite some time. Then I thought, how the railroad was a revolution in its day — how it took over for the horse and buggy. But the railroad wasn’t the end of the evolution of transportation. Later came the invention of the car and the invention of the plane. In briefly reflecting on how transportation has changed, I couldn’t help but think of how 3D printing could be just as revolutionary as some of these other inventions through history. And in thinking about 3D printing — specifically — I couldn’t help but think of Star Trek. 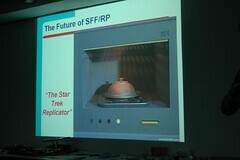 Do you remember the Replicator? To refresh your memory, a few of YouTube clips: here, here, and here (though this last one is a clip of it malfunctioning). There’s been a lot written about how Star Trek has presaged inventions that later came to be (here’s one for example). I might add 3D printing to that list (or any), too. The thing that really got me thinking, though, was when I compared the evolution of the personal computer to the 3D printer (or replicator). People who know what life is like without the computer often express their disbelief for how small the computer is when compared to its ancestor. “It used to take up a whole room! Now,I can put it in my pocket!” They would exclaim. There’s no doubt that the computer has evolved a great deal from its early days, but I wonder if this will be true of 3D printing? 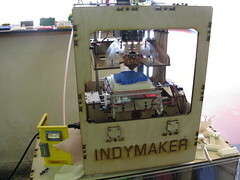 Will the cost of having a 3D printer be such that everyone can afford it? Will the speed at which it prints be so fast that people will laugh at how long it used to take for things to print? The rate at which technology is able to invent something and then invent something that is twice as good at what it first invented is growing exponentially. It’s hard to believe that just over 100 years ago, the Model T was invented. I’m not sure how far 3D printing will go or if it will take off and be as ubiquitous as computers, but I think it most certainly has a chance. This entry was posted in Technology and tagged Art, Car, Computer, Life, Star Trek. Bookmark the permalink. I love the post. I think that far more news outlets should be discussing 3D printing. The effects on the environment (less wasted material) and on the labor market (less benefit to sending manufacturing jobs to lower income countries) could both be very profound. Agreed: the potential implications are vast. It's actually a bit surprising that there is less discussion about it (on the 6 o'clock news, for example). I wonder why there hasn't been anything written about the potential (decimation?) of manufacturing jobs — period. Of course, there will still be workers necessary to manage the machines doing the work, but with articles like this one that predict "manufacturing jobs as a significant source of job growth over the next decade," it makes me wonder if the possibilities aren't being taken seriously enough.